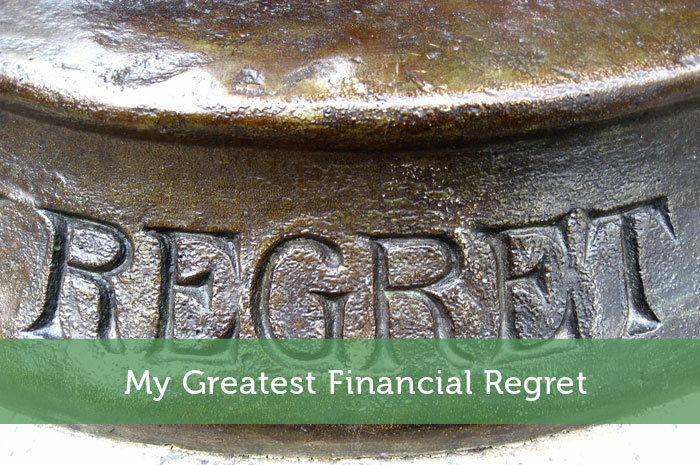 The following is a guest post about financial regret. If interested in submitting a guest post, please read my guest posting policy and then contact me. For some reason, I’ve just never been into stock trading for personal reasons; it hits too close to gambling, it’s a game of chance and luck, it can be volatile. I like some stability in my investments maybe that’s why I prefer rentals. My accountant used to trade heavily. He had two huge TV’s in his office where he watched the market all day (don’t ask me how he got any work done). One year, I went into his office and the TV’s were gone. He said he was having a heart attack literally daily and decided to get rid of it. I started off my financial career at Citibank in 2006 as a Teller. I worked with some good people. No matter how bad the day was, we always knew how to get back together and just have a great time at the branch. I was hired at a good time as well; it was before the housing bubble. The benefits were excellent, the pay was great. Within 2 years, America got into the recession and things went south. Then in March of 2009, the unimaginable happened. We all woke up and Citibank’s stocks went down to .99 cents. 99 freaking cents! Overnight, people lost half their wealth. There was panic everywhere. Unfortunately, being the first point of contact (teller…in a branch) didn’t help because customers directed their questions…and anger at us. There were also problems with Citibank’s executives and for some reason; Citibank was always in the news which made matters worse. People say with stocks, the rule is simple: Buy Low, Sell High. There were 3 categories of people at that time. 2) Those who held on to their stocks or bought more because they believed the market would bounce back. 3) Those who didn’t own stock at Citibank prior and bought. At that time, I didn’t have a lot of money saved; maybe just a few thousand dollars. There was a financial services representative who worked in a little corner office in the branch. All I had to do (which was what I failed to do) was make an appointment after work to buy some of the company’s stock. Even if I had borrowed the money, for this one venture, it would have been okay. I just kept telling myself, “you don’t have enough money and you shouldn’t borrow”. Also, a little research would have shown me Citibank’s stocks performance history. That information alone would have let me know that the dip was probably temporary. If I had bought $1000 worth of stocks, let’s include the fees and bring all my expenses to a round about $1,500. It would have been a good deal. Its 5 years now. I was surfing the net recently, and guess what? Citibank’s stock is about $50.00. I now have student loans totaling about $26,000. Even if I didn’t want to be in the stock business, buying the stock then would have yielded enough profit by now to pay off the student loan. Everyone complained about the recession, loss of jobs and all. But the truth is a lot of people made money during the recession. Truly financially savvy people say they have made more money in the recession. The same goes for the housing market. People with good credit and little money were able to purchase houses for way less than they would have a few years ago. What have I learnt from this? Closed mindedness is a terrible ailment. Whether you believe it or not, you are blessed with opportunities every day. Some are either right in front of you, others you will have to create. Either ways, you just have to ‘open your eyes’, make the right choice, and take action. Wow. That’s a big loss on your part. It really is hard for novice investors to stay with their investments when the stock prices starts to fall down to the ground, isn’t it? I hope you learned your lesson and be able to become a better investor. Good luck Ogechi! Yeah Mark, a HUGE loss mark. I cry each time I think about it. I have just graduated and my student loans would have been paid off by now. Ogechi… sad about it that you got this problem but i suggest you to take financial advice from a good adviser . It will be more helpful to you . I remember this happening and thinking “How can an organization that big have a stock price like that?” It takes a great deal of courage to invest at those low levels. Only do it with money you could afford to lose because at that price the stock is just a stone’s throw away from going bankrupt. I know right? That was my thought exactly. How could Citi’s stock be that low. I was like “Sweet baby Jesus, the end must be here”! It’s amazing how patterns of fear in investing keep repeating themselves, i.e. every time there’s a major stock market crash there will always be ample fearful people ready to bail out and losing money. Some people never learn, some do learn, and as time goes on there will always be a fresh intake of eager new investing recruits to make the same timing mistakes and emotion-based decision their predecessors did. I for one have done well in equities over the last 5 years or so because I belonged to Category 2 in your list, but I suspect had I been a much younger man in the same position my emotions would have got the better of me and maybe put me off investing for life! You always have to look at the long-term when it comes to investing in stocks. I buy in right after 9/11 when the market tanked and made a handsome profit. Same holds true for the housing crisis. At the end of the day when it comes to investing, it’s not a zero sum game. When you sell, someone is buying what you sell. If they aren’t the sucker, then it’s you. Don’t be too hard on yourself. I completely understand the caution you had at the time. And if things had turned out badly, as they sometimes do, you would be congratulating yourself now. No one has a crystal ball, and the situation at the time certainly felt unprecedented. I wish you well in your student loan repayment. If it’s a slow and steady process, that’s OK.
I’ve actually put some money away with the idea that I am waiting for another crisis to hit so I can invest with numbers very low. Like you, I have the opportunity to invest in stocks that would have net me enough to pay off a chunk of my student loans. Big regret. I had a similar experience. I started at Citigroup in 2007 & watched the stock price plummet too. I didn’t invest in Citi stock at the time, but did take the few thousand dollars I had and invested it in other companies. I totally regret not being more aggressive and investing more money when I had the chance. Don’t be too upset over the Citi stock price being $50 though, there was a 10:1 reverse split, so the actual returns really haven’t been as good as they look! This is how Warren Buffet made a lot of his money. “Buy stocks when there is blood in the streets.” The good ol’ contrarian approach. Exactly Combat Finance! Boy have I learnt. Hi Ogechi. You know what, I think you made the right choice. Investing in stocks is dangerous – even bank stocks. It would be very risky for anyone with just a few thousand dollars buy shares in any individual company! How could you have known at the time that Citibank was not going to be on the “List of banks acquired or bankrupted in the United States during the 2007–2012 global financial crisis” article on wikipedia? It’s a very, very long list. The only reason you regret it now is that you have information that simply was impossible to have at the time. Lehman Brothers was a 40+ billion dollar company, and when its investors found themselves in a similar situation, they fell into the same three categories as you described for Citibank. Things turned out very differently for them, and plenty of people likely have a story very similar you yours – except they bought. Thank you Matt! You’ve made me see things from a different perspective especially with the Lehman example. Yeah, no one has a crystal ball and it really could have gone the other way. What’s key is investing what one can afford to lose in the stock market. In my case, even $500 would not have been so bad.